Air Optix Night & Day Aqua is designed to be worn continuously for up to 30 nights and days. 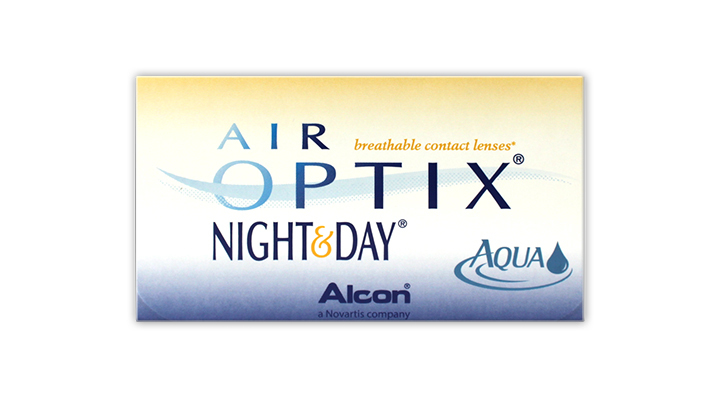 Air Optix Night & Day Aqua is made from a breakthrough material, Lotrafilcon A, which makes sleeping in lenses much safer again. The special ingredient which makes the lens so permeable is siloxane, not water, and this allows up to 6 times more oxygen to the cornea than standard soft lenses, making it a healthier option compared to lenses that let less oxygen through to your eye. The patented lens material helps to maintain moisture by minimising the rate of lens dehydration, creating an all day comfortable lens. In addition, an ultra smooth surface has been specifically designed to resist deposits so that your lenses stay clean and comfortable day after day. A light blue handling tint and inversion indicator has been included to help with handling and insertion. It is advisable to check with your eye care professional as to suitability before wearing overnight contact lenses. What a mistake! I had read ALL the posted reviews, and because of the mixed ratings decided that the lenses should be ok as I was an old hand at continuous wear. I have been wearing continuous wear lenses for 15 years, of varying brands. I was very happy with the old night and day lenses, and so when I found myself unable to order them decided to go with new "no difference" Aqua night and days. After the first night I woke up with my eyes glued together, have been unable to keep them in for more than about 10 hours at a time and feel they are much thicker and harder than any of the previous ones I`ve used. There is absolutely no way I will last a month taking them out every night, let alone a month of continuous wear. As I type, it is now less than a week since I first put them in (having taken them out at night for the last few nights) and already it feels like I need a new pair. More oxygen to the eye? It seems unlikely given how thick they are. Less likely to tear? Definitely, they are thick enough to prevent that. However, the whole point of continuous wear is that you aren`t taking them out and putting them in everyday, so less handling means less tearage. I can only assume people who found them fragile were handling them too much! That`s what disposable lenses are for. I am already looking for alternatives. I have been introduced to these by my mother, who has been wearing this type of contact for years. i was thinking to get laser treatment because i really didn`t enjoy putting the lenses in every morning i would normally use dailies, however i was a little sceptical about them, as a few times i fell a sleep in the dailies where horrible and the glued my eyes shut when i woke up and also at night they would get really dry and leap from my eye balls! I have to admit i have worn them past the 30 days in which i would imagine most people do, and it feels like im not wearing anything. A fantastic product and I shall not be getting laser now, as now i feel as though i don`t need to go through that when i can just get on with NIGHT AND DAYS. These lenses are awful. I used to have Purevision. Optician change to these and I didn't like them so changed back to Purevision. Now you no longer have purevision I am back to these. They tear easily. They dont give clear vision. More than twice the price of Purevision. I am going to try and get Purevision elsewhere as these are no good. I had to give one star but would have given no star if this was an option. AirOptix Night and Day Aqua - Horrendous. I have been wearing contacts for a few years & when I heard that there was going to be a lense that lasted for a month, I was delighted. Although they were pricey, I thought that the money would be well spent. How wrong was I? They were terrible. They dry your eyes and I had to remove them at night before bed because if I didn`t, come the morning, my eyes were so dry & sore. That was my primary reason for buying them, for the convenience. If they were not removed at night, my eye lids were practically glued together in the morning. I have reverted back to my original daily disposable lenses. They are far superior. I will not be purchasing again. Editors Comment: Unfortunately extended wear lenses do not suit everyone. We recommend a fitting and an assessment by an eye care professional to check out suitability.